Small shareholders have been left to fend for themselves in a number of companies that once promised moon on the Dalal Street. Companies such as ATN International, Raj Oil Mills and Zenith Birla, were once most sought-after. 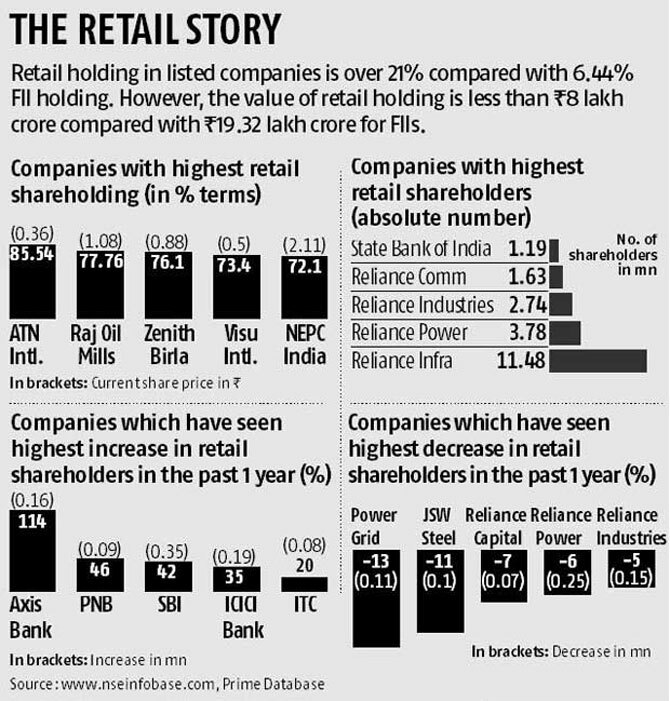 They have retail ownership of more than 75 per cent but with no liquidity and value. Interestingly, the retail ownership in listed Indian companies on a percentage basis is thrice that of overseas investors, but the value of their holding is less than half, signaling high retail interest in small-sized companies. According to Prime Database, retail shareholding at the end of the March quarter stood at 21.35 per cent compared to foreign institutional investors (FII) holding of 6.44 per cent. However, the value of retail holding was less than Rs 8 lakh crore compared to Rs 19.32 lakh crore of FIIs. On free-float basis, retail shareholders own 47 per cent of the outstanding shares of listed Indian companies, making them biggest non-promoter shareholders in the Indian market. However, if one looks at the value of these holding, it is a different picture altogether. This is because, typically, foreign investors own small percentage of holding in large blue chip stocks and abstain from investing in smaller companies. Retail shareholders on the other hand-those holding less than Rs 200,000-worth of shares in a company-are attracted to smaller companies, which are perceived to be cheaper, say market players. "Foreign investors, typically, buy only large caps. While, retail investors normally look for value in mid- and small-cap stocks. In some cases end up holding the baby," said Ambareesh Baliga, independent market analysts. Companies like Zenith Birla and Raj Oil Mills during their hay days in 2008-2009 had broad-based shareholding across institutional investors, retail and promoters. Currently, the bulk of shareholding in these companies is retail, while the institutional and promoter shareholding is negligible. For instance, the promoter-holding in Raj Oil Mills was more than 50 per cent when its share price was trading above Rs 100 in 2009. Currently, the promoter-holding is just 0.04 per cent and share price is hovering around Rs 1, BSE data shows. "Most often the promoter holding in such companies is pledged. 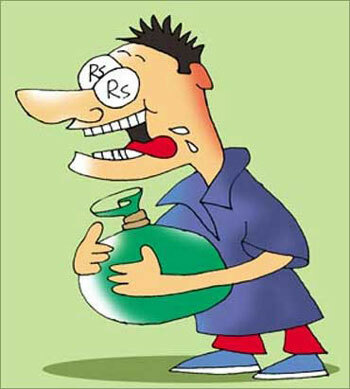 When the pledged shares are sold in the market by financial institutions, they end up in the hands of retail investors. Institutional investors are the first to smell the rat and exit immediately. The retail shareholding keeps increasing, as there is a tendency among them to average their cost price by buying more when the price falls," said Arun Kejriwal, director of investment advisory firm Kris. According to Prime Database, the retail ownership at the end of March quarter at 21.35 per cent was the highest since 2009, since the firm started tracking the data. In the last one year, banking shares have seen a sharp increase in retail shareholder base. SBI, ICICI Bank and Axis Bank, which have seen a sharp jump in share price in the past one year, also have seen their retail investor base swell. Kejriwal says even now a lot of retail investors get attracted to penny stocks thinking their share price may not fall further. "This is certainly not good, but it happens."